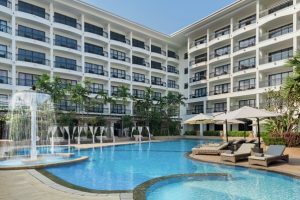 Courtyard by Marriott Siem Reap is Marriott International’s first Courtyard Resort in Cambodia, with a second hotel to follow when Courtyard Phnom Penh opens in the capital city later this year. The brand’s flagship in Cambodia is the perfect base from which to explore the many unforgettable things to do and see in the Kingdom of Wonder. The resort is a gateway to discovering the UNESCO heritage site of Angkor Wat, only 15 minutes away, with guests encouraged to embark on an early morning sun-rise Angkor Wat tour. The site stretches across more than 400 km and contains hundreds of temples and structures dating back to the Khmer Empire era. The most popular attractions are Angkor Wat, Bayon and its multiple faces, and root-riddled Ta Phrohm. The brand new APOPO Visitor’s Centre gives visitors the opportunity to discover the history of conflict in Cambodia, the impact of landmines on local communities, and the opportunity to meet and see HeroRATs in action. Visitors experience the realities of humanitarian de-mining and see how APOPO trains rats to save lives. It is an opportunity to learn about the mine clearance process from an expert and see the unique HeroRATs in a live demonstration where they will sniff out buried items, scratch at the surface to indicate to trainers and of course then receive a treat. This is truly a once in a lifetime experience. The Khmer Ceramics & Fine Arts Centre is a fascinating place to visit for those interested in the traditional art of the region. Located in Krong Siem Reap, the Centre is an organization aiming to rediscover and reintroduce Khmer ancestral pottery techniques and support the development of contemporary Khmer ceramics art. The centre offers pottery and painting classes and a wide selection of authentic Cambodian ceramics to buy. The Great Lake Tonle Sap is located about 15km south of Siem Reap and is the largest fresh water lake in Southeast Asia. A day trip from Siem Reap to Tonle Sap Lake is highly recommended. Guests can jump into a canoe with a guide and paddle through the mangroves to further-flung floating villages such as Kampong Phluk or the remote bird sanctuary at Preak Toal. The lake provides a habitat for over 300 species of fresh water fish, as well as snakes, crocodiles, tortoises, turtles and otters. More than 100 varieties water birds can be seen frequenting the area. Buddhist Water Blessings are a traditional Cambodian practice that date back to ancient times. The offering of holy water symbolizes the cultivation of the virtues of calmness, clarity, and purity of our body, speech, and mind. This water symbol reminds us to cleanse ourselves of our attachments and generate generosity, compassion, and wisdom. Guests can take part in the sacred Buddhist ritual at the Wat Atvea Pagoda outside Siem Reap. Dubbed Cambodia’s alternative to Cirque du Soleil, Phare, the Cambodian Circus’ daily jaw-dropping performances blend theatrics, music, dance, acrobatics, and modern circus art in the award-winning troupe’s big top tent in Siem Reap to retell Khmer folktales with a modern twist. The performers are trained by Phare Ponleu Selapak – in Khmer, The Brightness of the Arts – a Cambodian non-profit arts school located in Battambang, offering support to children, youth and the surrounding communities through artistic, educational, social and community outreach and engagement programs. Seeing and experiencing all that Siem Reap and its surrounds has to offer is best achieved with a longer stay and Courtyard by Marriott Siem Reap is the perfect springboard for a longer holiday filled with discovery and wonder. The ‘Stay More, Save More’ package is ideal for guests wanting to relax and enjoy the sights at a leisurely pace.